A Ngamba Island Day Trip usually starts from Kampala or Entebbe in the morning. It involves driving to the boat pier to start a cruise to Chimpanzee Sanctuary in Lake Victoria. Tourists enjoying a Boat Cruise to Ngamba Island from Entebbe area. 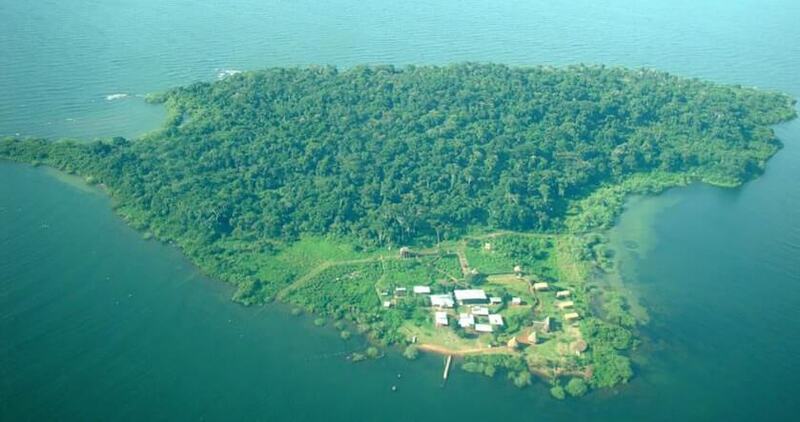 Starting a Ngamba Island Day Trip, a Chimpanze Island in Lake Victoria. After a short briefing by the guide, depart from Entebbe Pier on the shores of Lake Victoria and sail by a speed boat to the island. The voyage lasts 45 minutes to reach Ngamba. On arrival at the chimp island, get a small briefing and then view the morning feeding of the chimps from the visitors’ platform along the end of the fence. Visitors Watching chimpanzees from the Visitors’ Platform at Ngamba Island in Lake Victoria. The climax of the tour to the Chimpanzee Island is seeing the primates feed and play with each other. You are free to swim and visit the neighboring fishing village, ddo bird watching or take a rest. In a short amount of time you are there you will see such different personalities among the group, with some whistling for food and others clapping. Having enjoyed your stay to the sanctuary, return to Entebbe in the afternoon and have lunch at Windsor Lake Victoria Hotel, Botanical Beach Hotel or Lake View Hotel among others. Following lunch is a visit to the Uganda Wild Life Education Centre to see a variety of wild animals in their protected sections. This tour takes about an hour or slightly more. From here, go to Botanical Gardens where you will see a variety of butterflies & a variety of birds and also enjoy the spectacular of Lake Victoria. Drive back to Kampala marking the end of your one-day adventure experience. 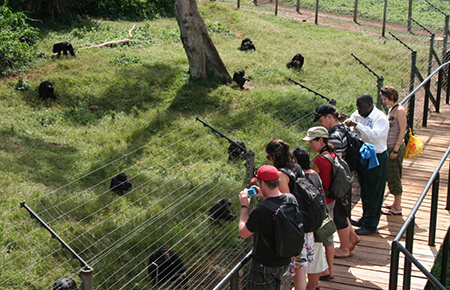 Ngamba Island Day Tour to see the Chimpanzee Feeding. 7. Visit to Uganda Wildlife Education Centre visit. Meanwhile, Ngamba Island is not the only safari detsination in Uganda where to see chimpanzees, there are many others. Kibale forest, Budongo Forest, Kyambura Gorge and Kalinzu Central Forest Reserve are other tourist attractions for chimpanzee safaris in Uganda. 2 Days Chimps Tracking in Kibale Forest : Track chimps and do birding in the Bigodi swamp while on a two day safari to Kibale National Park. 3 Days Chimpanzee Safari Kibale : Drive to Kibale Forest National Park, track chimps, visit Bigodi Swamp and sights and sound at large. Then drive back to Kampala on day three. 3 Days Kyambura Gorge Chimps Tracking : This safari involves chimpanzee viewing in Kyambura Gorge, a section of Queen Elizabeth National Park. A game drive and a boat cruise on Kazinga Channel, are also on the safari menu. 3 Days Chimp Trek in Budongo Forest : Visit Murchison Falls National park for much amazing wildlife treasures of Uganda. Take pleasure in chimp trekking, game drive, boat cruise and a short of the Top of the Falls before returning to Kampala on the third day. 4 Days Chimpanzee Trekking in Kibale : This safari is also about chimp tracking, more relaxation and Bigodi Swamp nature walk for bird watching purpose. 5 Days Chimpanzee Trekking Uganda : Kibale Forest chimps tracking and Bigodi Swamp are wonderful excursions.